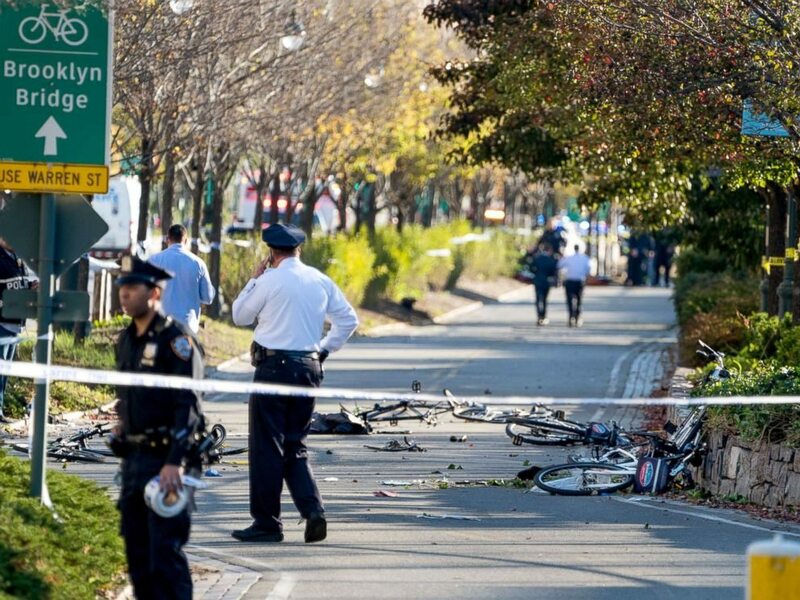 In what New York City Mayor Bill de Blasio called a "cowardly act of terror," a man driving a rental truck struck and killed eight people on a jogging and bike path Tuesday afternoon. he sprawling crime scene runs about 10 blocks along the West Side Highway, a few blocks away from One World Trade Center. 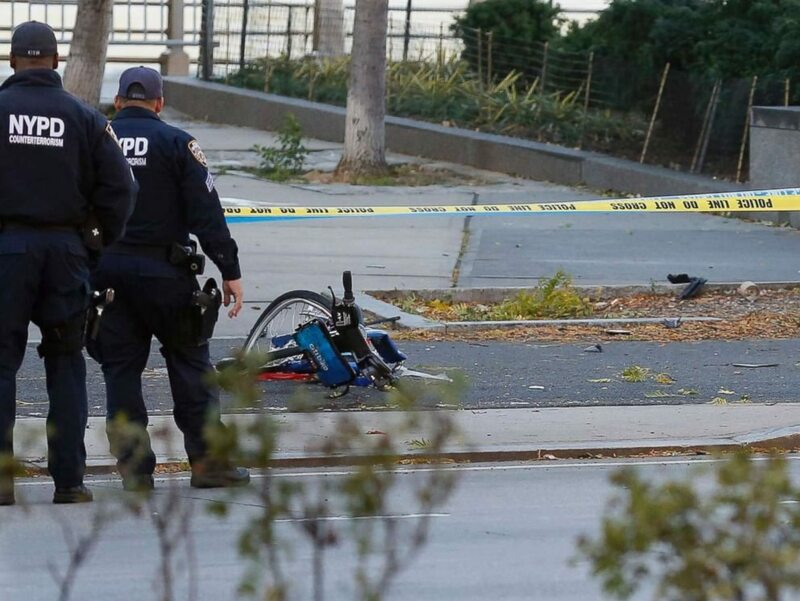 Witness Andrew Howell said he was walking along the bike path when he saw a truck plow into two cyclists riding about 20 feet in front of him; he said the impact sent one of the victims straight up into the air, and the man was motionless when he landed back on the ground. The driver then continued at a high speed before crashing, Howell said. A uniformed police officer was credited with stopping the carnage. 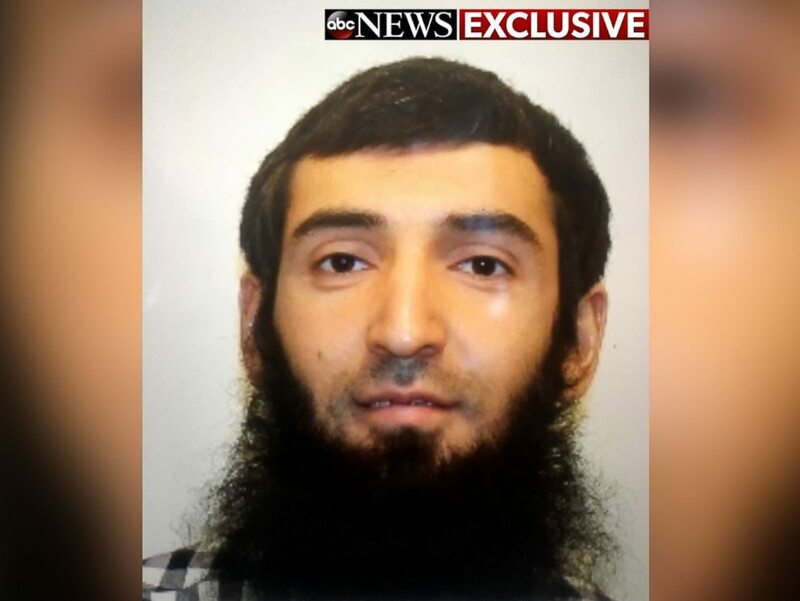 A suspect is in custody and was identified as 29-year-old Sayfullo Saipov of Tampa, Florida, multiple law enforcement officials told ABC News. 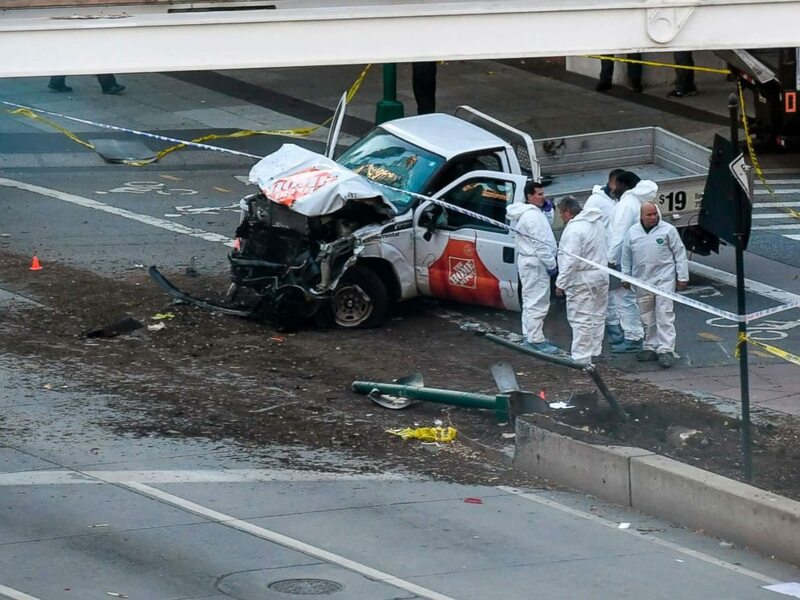 The suspect is reported to have screamed "Allahu Akbar" after the crash, and that is a key reason authorities are looking at terrorism as a possible motive, sources said. New York Gov. Andrew Cuomo said there was no evidence of a wider, ongoing threat but he said more police would be monitoring the streets on Halloween night. The city's annual Halloween parade in the West Village, which is near the crime scene, will still take place tonight, officials said. 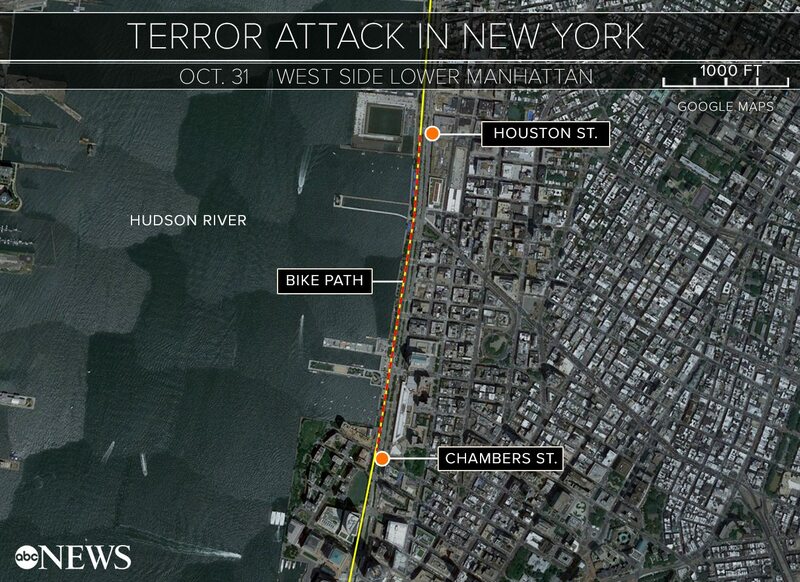 The deadly incident began at about 3:05 p.m., when the vehicle -- a Home Depot rental truck, according to the company -- entered the West Street pedestrian and bike path north of Chambers Street, hitting multiple people on the path, leaving some dead and numerous people injured, New York City police said. 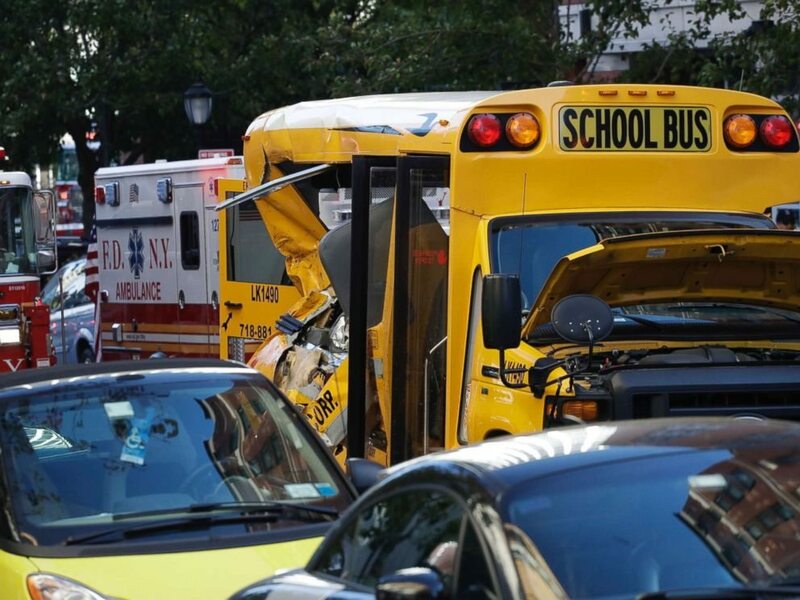 At Chambers Street, the truck collided with a school bus, injuring two adults and two children, police said. After the collision, the truck driver exited the vehicle brandishing what appeared to be two handguns, police said. A uniformed police officer confronted the suspect and shot him in the abdomen, police said. The suspect was wounded and transported to a hospital, police said. A paintball gun and a pellet gun were recovered at the scene, police said. Six of the deceased victims were pronounced dead at the scene; two more died at a nearby hospital. Police said 11 were wounded with serious but non-life-threatening injuries. 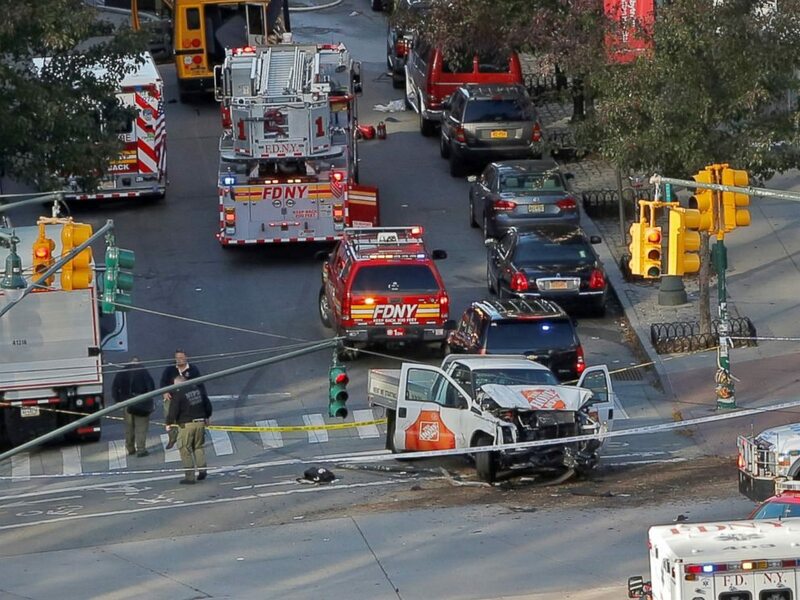 A witness told ABC's New York station WABC that after the truck hit multiple people on the bike path, it crashed into a school bus at Chambers and West streets, near Stuyvesant High School. "Everybody started running," the witness said. "... Everything was happening so fast." The witness added of the driver, "He kept going all the way down full speed." "Thank God the trick-or-treaters weren't out yet," the witness later said. Video from the scene showed mangled bicycles strewn across the bike path. “I called 911," he said. “I couldn’t do anything more to help. I’m still in shock." The FBI responded to the incident. They should outlaw trucks immediately. Just outlaw Islam, it doesn't work outside the Middle East. Find this scumbag's entire family in the US, including distant relatives, investigate them, and then deport them immediately. You can’t win a war by fighting defensively. You have to make the enemy fight defensively. Hunt them down and exterminate them. They are being hunted down, but convert's keep getting created. Do you live here? Or can you not afford to leave? Bunch of cowardly low life scum. Influenza kills more people in a year than those pussies can manage to do. Stupid Hadjie could only manage to take out 8? On Halloween nonetheless. Clueless camel fornicator. Where are they recruiting their 'warriors' from? The retard ward? NY mayor DeBlasio won’t allow mosques to be surveilled for inciting violence or jihadism. That’s not exactly hunting them down. They don't need to watch the Mosques, they need to oversee the entire www, and stop the trash being spread. 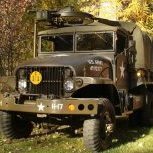 NY mayor has no authority over the military, and other U S goverment agency's. I am sure the mosque is wired from the sub floor, to the towers. Hang them high in a tree instead. Reported he came to the USA in 2011 on the Diversity Visa program. Can that program would be a start. It appears the ruling elite want NYC to be like London, it is already a sanctuary city. What I find scary is the attacks so far are minimal lone wolf with little money or coordination put into them. We know that the terrorist organizations are capable of more. w/pig balls in their mouth.